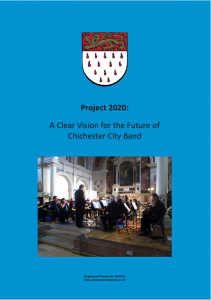 In September of 2015, Chichester City Band chairman, Howard Smith, gave an interview to the Chichester Observer, outlining an ambitious new 5-year plan for the band. This included our plans to develop relationships with local businesses as well as individual supports. A key driver for the plans is the need to find a permanent home for the band, which has never had a permanent base in its long (over 100 year) history!